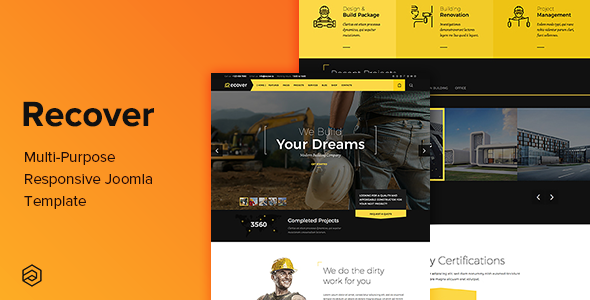 Recover is an impressive multi-purpose Joomla template designed for SME businesses and large enterprises alike. Every aspect and aesthetic of the template has been carefully design to meet today’s world standards in redefining the web. It comes with 6 beautiful color styles, custom widgets and quickstart sample data to get you up and running fast. 6 beautiful color styles included. Each color style features unique google font sets and unique color palettes. We’ve included the Timetable scheduler – (Save $20) which can be used to build beautiful timetables and schedules for schools, doctors, events, gym or for any business purpose. Instant ajax Search – When you search, the search box provides instant search results on a popup menu. J2store compatible template – now you can build your E-commerce store front using J2store and the integrated shop styling in this template. Data structures – We’ve added schema.org recommended data structures to K2 blog. FREE admin template style – We’ve included a custom style for the backend admin panel. Arrowthemes does it again! I want to give 5 stars for each aspect; design quality, customizability, feature availability, flexibility etc, and customer support! My advice to all other Joomla template customers; if you are frustrated with previous templates that are hard to customize and that come with crappy customer support who does not understnd English, the templates by Arrowthemes will make you delighted! Every website I have developed using any of the Arrowthemes templates became a success! Thank you Joel for your outstanding work!! Perfect with a great support. The Customer Support is top notch. The Design, Quality & Flexibility of the theme are excellent. Undoubtedly one of the best Joomla themes.